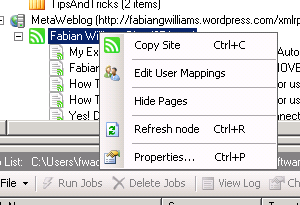 Then, as I did, you can use Metalogix Migration Manager for Blogs and Wikis. I also wanted to be able to transition off one blog to another without abruptly turning off the proverbial faucet of information without adequate notice to my readers and subscribers. In order to do this, I performed an initial migration of ALL the content and then delta migration of just singular posts from time to time. 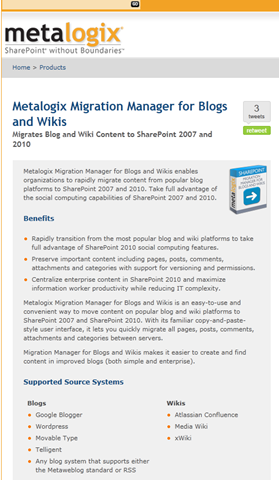 Metalogix Migration Manager for Blogs and Wikis allows for all the above and more. Below you will find out how I used the tool, I hope that this helps you in your decision making for the same or related tasks. 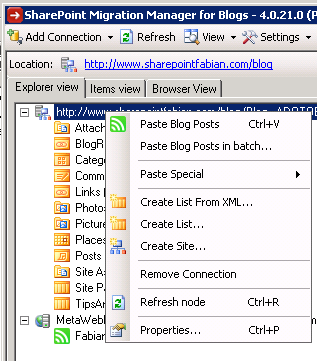 As previously mentioned, the tool has the ability to move content from a variety of Blog Content Sources into SharePoint. 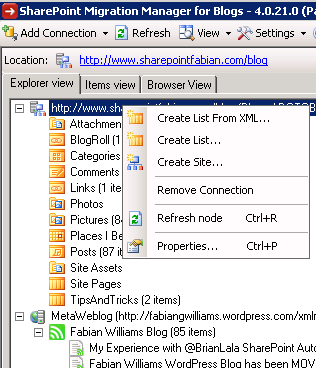 In my experience it will use the Object Model when you are local to the SharePoint Server and use Web Services when you are conducting the Migration Remote, for example, you have the tool installed on your workstation and both the source Blog and destination Blog are remote to your location. Below is a screenshot of the various sources. A few options are there for customizing the migration experience. One particular on I would like to call out that was useful to me was the ability to “Configure global Mappings…” this allows me to create a mapping between source accounts and destination accounts. This assures me that the Author of my original blogs is maintained when the transfer is effectuated. 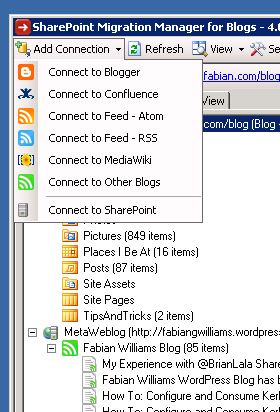 Once you have connected to your Source Site, the migration is very easy. All you need to do Right-Click on the Source Blog and select “Copy Site” which copies all of the content for preparation to the Destination Blog. This option will move ALL content from one place to the other. Alternatively, you may only want to move specific Blogs, in that instance you Right-Click on the Source Blog and chose “Copy Pages” which applies ONLY the selected item for preparation to the Destination Blog. This option will move only that specific content from one place to the other. 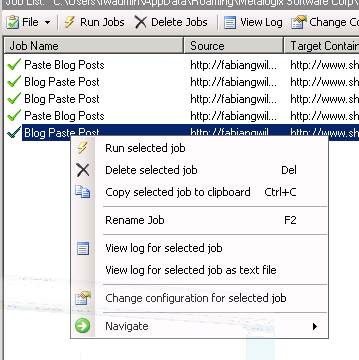 In addition to that you may create new Sites as a part of the Paste process which will spin up a site as well as copy/migrate the Selected Posts. The tool also has a great reporting/logging feature which runs and can be viewed while the blog migration process is under way. On completed migration you may also elect to re-run that job which keeps the same parameters and criteria that was selected thus cutting down the time it takes to execute a job. Below is an example of what a Log File looks like when it is opened. 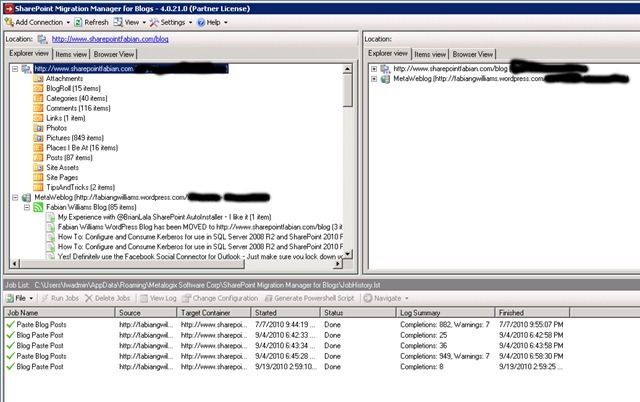 In fact, I will have to use the tool again to Migrate this Delta change to my SharePoint 2010 Blog Ha ha! As usual, I welcome all questions or comments, Cheers!